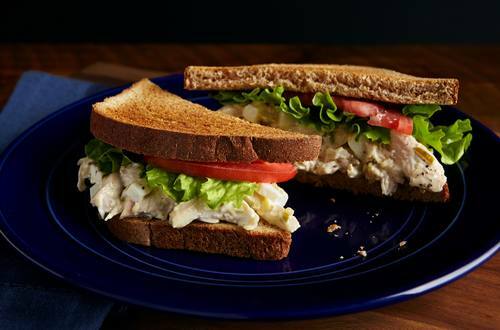 Our very own homemade chicken salad sandwich recipe with shredded cooked chicken. 1 Place chicken in large pot with water to cover. Add 1/2 teaspoon salt and bring to a boil. Reduce heat to low and simmer until chicken is thoroughly cooked, about 45 minutes. Drain chicken; cover and refrigerate until cool or up to 24 hours. 2 Pull the cooled chicken into shreds and place in large bowl. Add the Hellmann's® or Best Foods® Real Mayonnaise, eggs and relish. Stir together until well mixed. Season with salt and pepper. Spread 2 to 3 tablespoons of mixture on 10 bread slices; top with remaining bread.